Celtic manager Ronny Deila accepts he still has to prove the job is not too big for him. 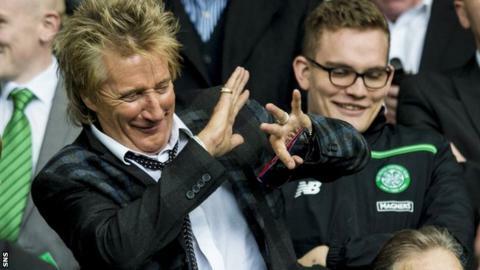 Celebrity supporter Rod Stewart said after the end of Celtic's European campaign that he felt the Norwegian was out of his depth. Despite having won two trophies last season, Deila acknowledges he is not beyond criticism. "At Celtic, when you don't achieve what the demands are, you have to prove yourself," he said of his critics. "But you have to get the chance to do it and I will do everything I can to prove that and make them swallow their words." Deila, whose side could still complete a domestic treble this season, admitted he was a big admirer of singer Stewart. "He's a good ambassador for the club," said the manager. "I met him once when we won the league trophy, so hopefully I can meet him again in that (scenario). "When you don't get the result you want, of course people will be critical of what's happening and I have no problems with that. "I've had a lot of positive critics as well, before the European campaign this year, so this is also something I have to manage. "The only thing I think of now is to finish this season in a very good way and we need to make the improvements I know can make us successful."